Here's my rendition for Tiny Tim. 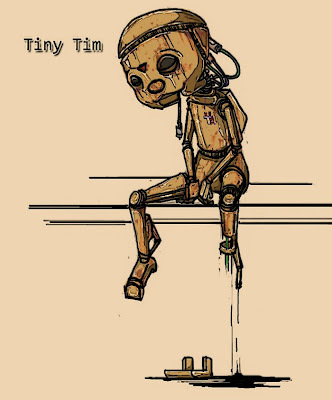 My friend gave me the idea to make it "Tinny Tim". It was hard for me to not give it a nod towards 3P0. Seeing Tiny Tim being a poor sick kid, I could not help but make the robot as sad and as poorly kept as I could. Instead of the crutch I just decided to loose the leg all together.